How would you make a hole a foot in diameter? How would you make a 1 mm hole? Could you then align a reamer to that little hole exactly right? How would you go about cutting threads on a slender titanium bone screw three inches long? And what would it be worth to know for sure when you’re turning Inconel that the edge on the cutter is staying nice and cool? What would this mean to your cutting speed? To your tool life? To the surface finish? To your profits? It’s been said that there is nothing new under the sun. That may be true, but the creative folks in the tooling business never stop looking for ways to help you save time, save money and get the contract for that nearly-impossible-to-machine part. Here are some tools and technologies that can make your work easier and more profitable. Drilling, countersinking and thread milling aren’t news. But what if you could do all three with a single tool? You could save time and maintain accuracy with no tool changes and no repeatability issues. The vividly named Thriller tools from Emuge Corporation in West Boylston, MA, do just that. One version, the BGF, first drills and countersinks a hole (see figure). Then it mills the thread. It is intended for short-chipping materials, and for producing threads in the range of M4 to 3/4”. This Thriller is available in a 2-flute design, or in a 3-flute design, which shortens cycle times and performs well on cast-in thread holes, according to Emuge product literature. Another version, the ZBGF, doesn’t drill first, but it generates a threaded hole in solid stock. The lower figure shows the steps: First the tool is positioned at the center location of the hole. Then it moves off to the side to find the starting point for the thread. It revolves around the center position, cutting threads as it goes deeper into the material. Finally, when the hole is complete, the tool returns to center and retracts. This type of Thriller is designed for hardened or difficult-to-machine materials for thread depths up to 2x the hole diameter. It produces short, easy-to-remove chips, even in materials that tend to be long-chipping. Both types of Thriller include through holes for coolant. 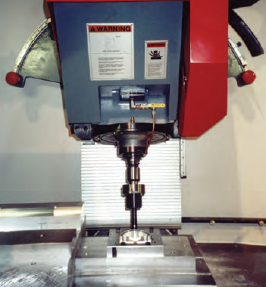 The Emuge web site provides programming instructions for thread milling with Thriller tools. Thread whirling, a technology developed decades ago, is gaining popularity as a machine accessory for putting threads on parts such as bone screws, where the length to diameter ratio is large. For this type of part, the pressure required for single-point thread cutting tends to bend the part, causing accuracy to suffer. Thread whirling uses multiple cutters at the same time, so the cutting forces counter each other and bending is not an issue. “Whirling” a titanium bone screw with a thread whirling attachment on a Citizen C16. A typical thread whirler accessory provides multiple cutters that surround the screw blank and spin — or whirl — around the blank as it turns slowly. The whirler spins at perhaps 5000 rpm, cutting the threads, while the screw may turn at about 20 or 30 rpm, explained Scott Laprade, sales and marketing manager at Genevieve Swiss Industries, Inc., Westfi eld, MA. The photo above shows a thread whirling attachment designed to operate with several different Citizen screw machines. A thread whirler accessory may mount on the turret or on the gang slide. Rough/finish boring system: Why use two when one will do? The IntraMax boring system performs rough and finish boring in one operation, with one tool. The tool has two adjustable cutters mounted on opposite ends of a beam. In setting up the job, the cutters are adjusted so that one engages the part first, and rough-cuts. The other cutter is offset from the first, so it finishes cuts the same area. 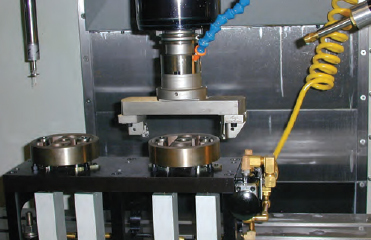 Outside diameter roughing and finishing, completed in a single pass on a vertical machining center with the Command Urma IntraMax system, eliminated the need to perform a turning operation. The IntraMax system can be adjusted for inside diameters from 1.9 to 14 inches, and can also be set up to cut outside diameters from 0.35 to 9.8 inches. This can save doing a turning operation on a part. Finish diameters can be set by 0.0002” increments. Made by Urma AG, of Switzerland, the IntraMax boring system fit machines with HSK 63A and 100A, V-Flange or BT tooling, and is available through Command Tooling Systems, Ramsey, MN. Many are the benefits of keeping the cutting edge cool. Several manufacturers, three of whom are noted below, have developed tool designs that deliver coolant directly to the business end of the cutter. Keeping the edge cool helps prevent or delay failure modes such as built-up edge or cratering, which are aggravated by high temperatures. A cooler cutting edge can also produce a better surface finish. Coolant has particular difficulty reaching the cutting edge in deep grooving and parting operations. To alleviate this problem, Iscar Metals, Inc., Arlington, TX, offers an ingenious method for cooling this critical area; a grooving/cutoff tool that supplies coolant right through the insert, delivering it near the cutting edge. 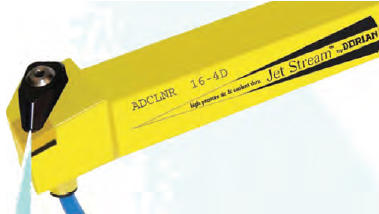 This Jet Cut version of the company’s Do-Grip parting tool, recommended for use with stainless steel and high temperature alloys, keeps the cutting edge temperature down. This can extend tool life by as much as a factor of three, according to Michael Gadzinski, training manager at Iscar. Coolant can be delivered to the insert through the coolant passage in a special blade used on regular blocks, or through a special block. Both incorporate connecting ports and passages for the coolant supply. For Jet Cut, the coolant pressure should be at least 200 psi, Gadzinski said. Any coolant can be used, but it needs to be filtered through a 10-micron filter. “The big thing people who are running high pressure coolant need to be aware of is filtration,” he said. The Point-Blank Direct Flow turning holder from LMTFette, Cleveland, OH, takes a different approach. Standard inserts fit in the holder. Three holes next to the insert flood its surface with coolant. There is also boring bar that uses a similar coolant delivery design. 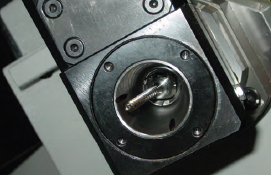 Toolholders deliver coolant across the insert in the Point-Blank system from LMT-Fette. The Jet-Stream turning toolholder and boring bar from Dorian Tool, East Bernard, TX, provide either air or liquid coolant through an opening in the clamp that retains the insert in the holder. The boring bar includes a second coolant or air jet that helps flush away chips. Jet-Stream toolholders from Dorian Tool blast air or liquid coolant through the insert clamp directly across the insert. Dorian Tool originally developed this focused-coolant concept to meet the company’s own needs, said product manager Alan Steinberg. From there, the concept evolved into Jet-Stream products and went on the market several months ago. Sometimes it seems that parts are just getting smaller and smaller. With this decrease in size comes tighter tolerances and accompanying challenges in machining. Following are two tools specially designed for hole-making and reaming in small dimensions. For boring small holes, 1 mm to 8 mm in diameter, the Multidec-Bore Micro offers a variety of cutter shapes in coated or uncoated carbide. The tool holder fits in a standard chuck, and the cutter insert is secured in the tool holder with a special nut that allows changing inserts by hand. The toolholder locates the insert axially and radially, so no adjustments need to be made after changing inserts. 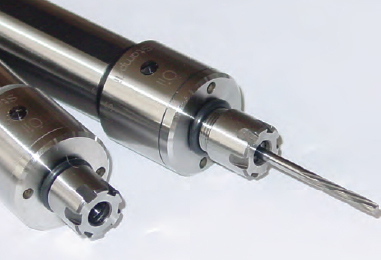 The Multidec-Bore Micro is made by Utilis of Switzerland and distributed in North America by Genevieve Swiss Industries, Inc.
Misalignment between a micro reamer and a very small hole in a part can result in inaccurate reams or broken reamers. Or, if you use a conventional floating chuck, it will allow the reamer to misalign with the axis of the hole, resulting in a less-than perfectly round hole. Genevieve Swiss Industries offers a selection of orbitally floating micro reamer chucks. These allow offsets of up to 0.009”, while still keeping the reamer parallel to the axis of the hole. Versions of these chucks are available in ER8 and ER11 sizes. Orbitally floating micro reamer chucks from Genevieve Swiss Industries. The task: drill more than 100 holes inside an aircraft fuselage component, parallel to the bed of the machine. Sounds like a lot of fixturing and hand-drilling, right? Not necessarily. At Precision Machine and Manufacturing in Grove, OK, they make just such a part on a Toshiba 5-axis vertical machining center. When it comes time to drill all those holes, the tool of choice is a coolant-powered right angle drill head, said Wade Caudill, product development engineer at Precision. 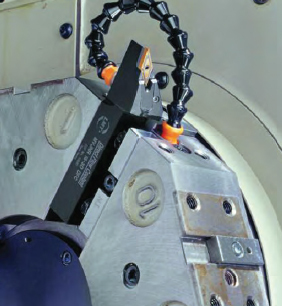 Able to fit into openings as small as one inch in diameter, the Titespot head from Eltool Corp., Cincinnati, OH, uses high-pressure coolant to drive a positive displacement ball piston motor. Depending on the load, the coolant pressure needs to be between 200 and 2000 psi, said Ed Crotty, vice president of marketing at Eltool. The speed of the unit depends on the load, the coolant pressure and flow rate. For example, with 6 lb/in of load, the speed might be 5000 rpm at 450 psi and 9000 rpm at 1000 psi. Since the head doesn’t depend on the spindle for power, it is possible to mount the Titespot head and use the spindle as an indexing device, which is what Precision Machine does when drilling all those holes. The figures [below and right] show holes drilled with at Titespot unit inside a hydraulic pump housing. 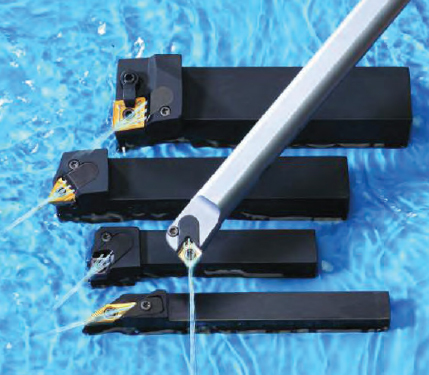 Besides drill heads, Eltool also makes a coolant driven keycutter that machines keyways right on the machine, so a separate broaching process is not needed. Coolant-driven angle head drilling multiple rivet holes in a prototype leading wing frame component on a Cincinnati Machine V5 vertical machining center. All these products started out with someone recognizing a need or problem.If you’re having trouble with something in the shop, you’re probably not the first person to encounter it. If you have the idea that “this process can be done more efficiently,” you’re probably right. Ask around. Check the Internet. Someone out there may have already created a solution. If not, maybe this is your opportunity to invent one. It can solve your problem and could become a whole new product line for your company. Many in the machining business find that part of its attraction is that every day there’s something new to deal with. And that’s why new technologies are being developed all the time — and old ones dusted off and brought back in new applications — to help keep those parts coming off the machines.